Situated along North Bluff Road, this premier development opportunity provides maximum exposure and terrific views. At an elevation of 353 feet above sea level, 14990 North Bluff Road has open southerly exposure. 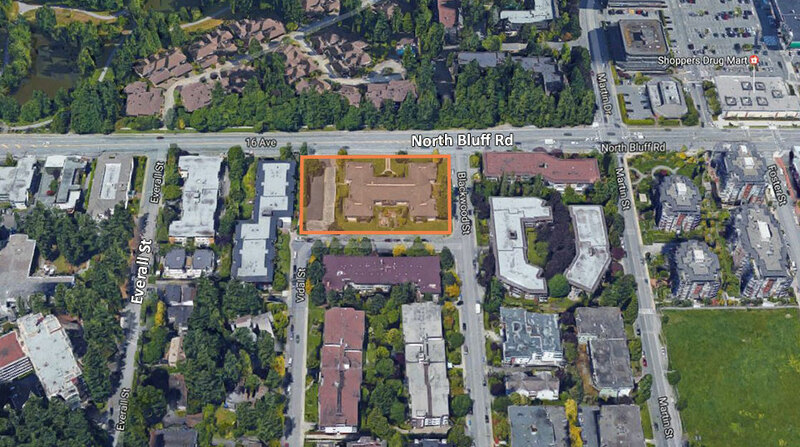 300 feet of frontage along North Bluff Road (16 Avenue) and a gross site area of approximately 64,764 square feet. Recent DRAFT OCP outlines a 3.0 FSR in combination of both market housing and rental and a 18 Storey height restriction. Perfectly situated for a subdivided and/or phased development scenario. This Property is ideally situated in the quaint beach town of White Rock, making it a prime investment and development opportunity. Along with North Bluff Road, 14990 also fronts Blackwood Street and Vine Avenue/Vidal Street. 45 kilometres from Vancouver, and only 6 kilometres from the Canada/USA border. This affluent seaside community is clustered along 8 kilometres of sandy beaches and the warm waters of Semiahmoo Bay.